HOW THEY GOT HERE: The Jayhawks hammered Horizon League-champion Detroit, 65-50, and then barely escaped 10th-seeded Purdue, winning 63-60 on the strength of some terrific defensive plays down the stretch. Junior guard Elijah Johnson hit a huge three-pointer and then stole the ball and scored on a breakaway layup to give Kansas a late one-point lead, and Tyshawn Taylor scored on two breakaways down the stretch, including a dunk with 2.5 seconds left that virtually sealed the game for the Jayhawks. BURNING QUESTION: Can they really do this? One year after losing three first-round NBA draft picks, including twin forwards Marcus and Markieff Morris, and guard Josh Selby, can Kansas really get to the Final Four? The road got much easier when North Carolina point guard Kendall Marshall went out with a fractured bone in his right wrist, but the Jayhawks still have their work cut out for them. Head coach Bill Self is one of the best in the nation, so overachieving has become part of the norm in Lawrence. Still, getting to a Final Four with a group that wasn’t ranked in the preseason Top 25 in some corners would be an incredible accomplishment. KEYS TO WINNING THE REGION: Kansas will need better guardplay, particularly from senior point guard Tyshawn Taylor, if they want to defeat North Carolina and move on to the Final Four. Taylor has disappeared down the stretch in some games for the Jayhawks, and he’ll need to play like a senior bidding for his first national championship if he wants to get to New Orleans. The Jayhawks rely on National Player of the Year candidate Thomas Robinson to provide much of the offense, so he is going to have to take another giant step forward towards winning that award if Kansas is to advance to the Final Four. X-FACTOR: Elijah Johnson. The junior guard from Las Vegas averaged 9.6 points during the regular season, but has come on strong in the postseason for the Jayhawks. Johnson put up a career-high 26 points in Kansas’ 83-66 win over Texas A&M in the Big XII quarterfinals, and scored 15 points in both the Jayhawks’ Big XII semifinal loss to Baylor and Round -of -64 NCAA Tournament win over Detroit. He also put up 18 points in the win over Purdue. 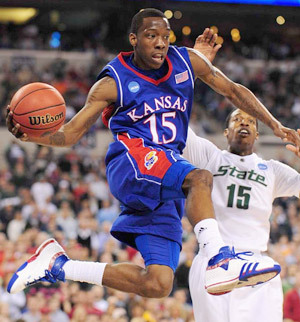 If Johnson can continue to play like the guy whose number he graces on the court, (Mario Chalmers’ number 15), Kansas will have a good chance to be among the final four teams standing in this tournament. BEST-CASE SCENARIO: Kansas rolls past N.C. State, which is intimidated by the magnitude of the Sweet 16. The Jayhawks then face a discombobulated North Carolina squad, which is playing without its point guard and therefore has no direction offensively. KU gets even more revenge on former coach Roy Williams by sending the Tar Heels home in the Elite Eight, and advancing to their second Final Four under Bill Self. WORST-CASE SCENARIO: The Jayhawks struggle to guard versitile N.C. State forward C.J. Leslie, much like they did Purdue’s Robbie Hummel. Thomas Robinson gets in early foul trouble and Kansas has nowhere to turn offensively. The ‘Hawks fall victim to the Wolfpack in the Sweet 16. CHANCE TO WIN REGION: 41%. The loss of Kendall Marshall hurts the Tar Heels, but Kansas has not been consistent enough all season to allow Jayhawk fans to ooze confidence. If Robinson and Taylor come up big in the next two games, Kansas has a great chance to advance to New Orleans. If not, the Jayhawks likely won’t get there. HOW THEY GOT HERE: Head coach Mark Gottfried has done a tremendous job with this bunch, leading the young Wolfpack to NCAA Tournament upsets over San Diego State and Georgetown on their way to the Sweet 16. 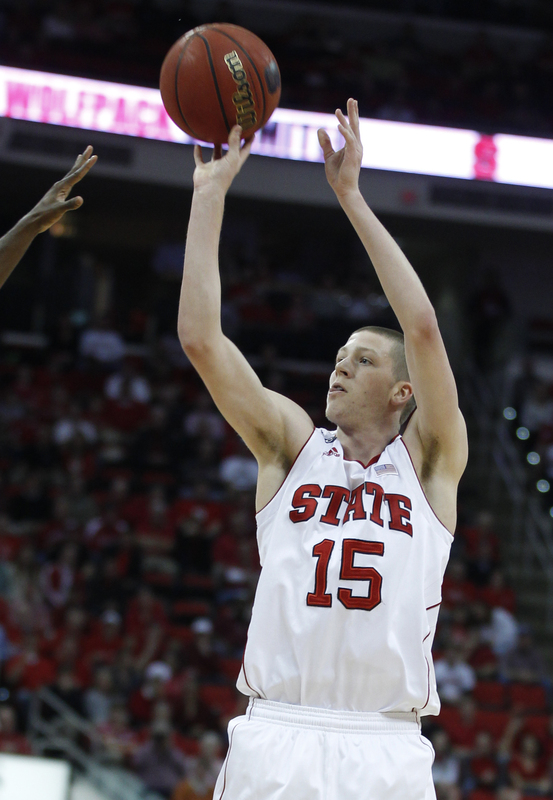 “You’re good enough,” Gottfried told his team in the locker room before the third-round matchup with the third-seeded Hoyas. “There’s a plane waiting to take you to Saint Louis, there’s a hotel waiting there…and there’s a game waiting for you there. Let’s go out and get it.” The Wolfpack did. BURNING QUESTION: Can N.C .State grow up right now? The Wolfpack have a roster full of underclassmen, and weren’t expected to turn a 15-16 season last year into a Sweet 16 berth in 2012. Yet, here they are, way ahead of schedule in coach Mark Gottfried’s first year on the job. The challenge for Gottfried now will be getting his team to believe that it is good enough to get to the Final Four right now. KEYS TO WINNING THE REGION: The Wolfpack almost defeated North Carolina in the ACC Semifinals with a healthy Kendall Marshall, so it’s not impossible to imagine them kicking their arch-rivals to the curb in the Elite Eight without him. Still, if N.C. State is going to pull that off, they are going to need an incredible performance from forward C.J. Leslie, who is an NBA prospect and one of the most versatile big men in the nation. X-FACTOR: Junior forward Scott Wood. The Wolfpack are 9-2 this season when Wood scores 15-plus points, so keeping him on lock is going to be one of the keys that Kansas coach Bill Self focuses on. Wood shoots 43 percent from three-point range, so the Jayhawks must limit his open looks. 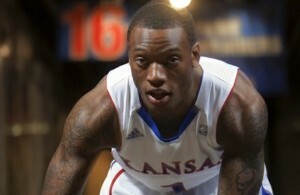 BEST-CASE SCENARIO: Kansas forward Thomas Robinson gets in early foul trouble, and C.J. Leslie runs wild on the Jayhawks’ remaining big men. Scott Wood catches fire, and Lorenzo Brown makes huge shots down the stretch as N.C. State does what Purdue should have done last round and sends the Jayhawks home early. WORST-CASE SCENARIO: Leslie finds early foul trouble, Brown and Wood struggle, and the Wolfpack can’t get out of their own way as the Jayhawks romp to the Elite Eight. CHANCE TO WIN THE REGION: 14%. It’s going to be tough sledding for N.C. State in this region, as both Kansas and Carolina have survived to the Sweet 16. C.J. Leslie is the Pack’s best hope for a Final Four run, but it’s not likely considering the talent N.C. State is going up against. Still, it’s been a terrific first season for Mark Gottfried in Raliegh.